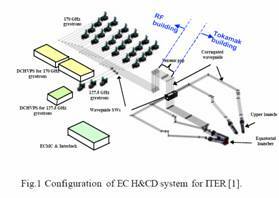 N.Kobayashi, et al., “Design of Electron Cyclotron Heating and Current Drive System of ITER”, Proc. of 17th Topical Conf. 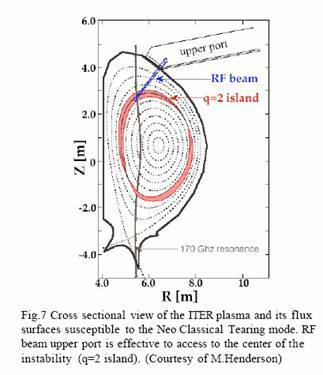 on RF Power in Plasmas, A01, Clearwater, Florida, May7-9 (2007). 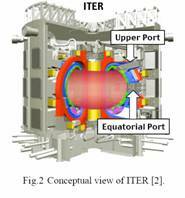 “Technical Basis for ITER Final Design Report, 2001”,available on the internet at www.iter.org. M.Thumm et al., “A high-efficiency quasi-optical mode converter for a 140-GHz 1-MW CW gyrotron”, IEEE Trans. On Electron Devices, 52, No. 5, 818 (2005). G.G.Denisov et al., “Method for synthesis of waveguide mode converters”, J.of Radiophysics and Quantum Electronics,Vol.47, no.8, 615 (2004). 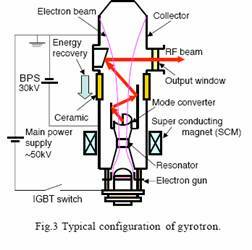 J. Neilson, “Optimal synthesis of quasi-optical launchers for high-power gyrotrons”, IEEE Trans. Plasma Science, 34 635 (2006). K.Sakamoto, et al., “Achievement of robust high-efficiency 1MW oscillation in the hard-self-excitation region by a 170GHz continuous-wave gyrotron”, Nature Physics 3, 411 (2007). 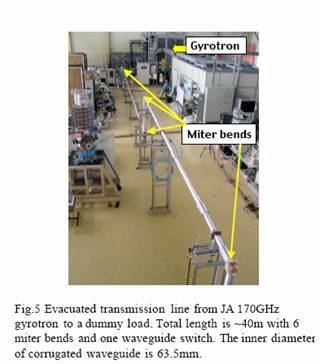 K.Sakamoto, et al., “Development of Long Pulse and High Power 170GHz Gyrotron”, J.Phys. CS, 25, 8 (2005). A.Litvak, “Development of megawatt gyrotrons for nuclear fusion in Russia”, The joint 31th International Conference on Infrared and Millimeter Waves and 14th International Conference on Terahertz Electronics, Sept.19-23, 2006, Shanghai, China, Conference Digest (ISBN:1-4244-0399-5),(2006) p.8. G.Denisov, et al., “Development in Russia of High Power Gyrotrons for Fusion“, in the presentation at 4th IAEA Technical meeting on ECRF Physics and Technology for ITER,Vineena, June 6-8 (2007). B.Piosczyk, et al., “165-GhzCoaxial Cavity Gyrotron”,IEEE Trans.Plasma Sci, 32, 413 (2004). B.Piosczyk, et al.,” 170 GHz, 2MW,CW, coaxial cavity gyrotron for ITER, in Proc. of 21th IAEA Fusion Energy Conference, Chengdu, China, 16-21 October 2006.IT/2-4Ra (2006). J.P.HOGGE, et al., “Development of a 2-MW, CW coaxial gyrotron at 170 GHz and test facility for ITER”, Journal of Phys:CS, 25, 33 (2005). 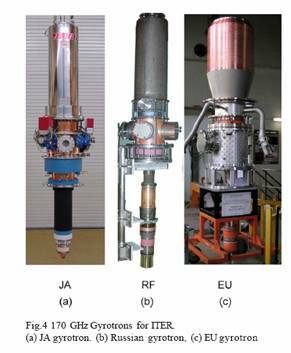 K.Takahashi, et al., “Development of EC launcher components for ITER”, J.Phys CS, 25, 75-83 (2005). K.Takahashi, “Design and development of EC H&CD antenna mirrors for ITER”, Fusion Eng. And Design, 81, 281(2006). K.Kajiwara, et al., “Development of the transmission line and the launcher for the ITER ECH system”, this conference. M.A.Henderson, et al., “The Front Steering Launcher Design for the ITER ECRH Upper port”, Journal of Physics, CS, vol.25,143 (2005). R,Heidinger, et al., “Structual integration studies for the ITER ECRH Upper Launcher”, Journal of Physics, CS, vol.25, 66(2005).